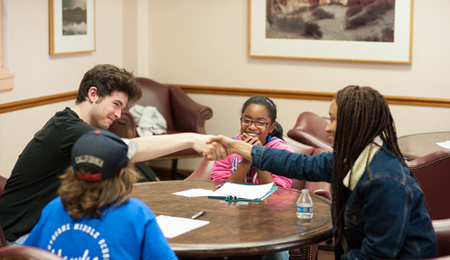 Mediation programs can help manage and resolve conflicts between young people. Research has shown that schools that use peer mediation programs can reduce the number of disciplinary actions, such as detentions, suspensions, and lockdowns. It also encourages more effective problem solving, improves school climate, and provides youth and staff with an alternative forum for problem solving. If your school is interested in peer mediation, the CRC can help. We provide technical assistance to schools to include planning, training staff and students, and assistance with initial oversight until your program is up and running well. To learn more about our programs, please contact us.